Before it was the Clash hype that all the developers were running towards. Now, it is the PUBG trend that seems to attract a large portion of developers. 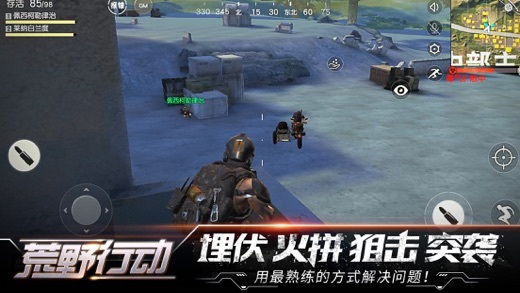 NetEase has recently released a PUBG-like game for mobile devices. Although the game is dubbed in Chinese, it is translated into ”Wilderness Survival.” PUBG (Playerunknown’s Battlegrounds) allows up to 100 random players to parachute into an island, each selecting his own landing location. Once landed, players start searching for weaponry that will help them eliminate all the other players and be the last survivor on the island. Similarly, Wilderness Survival gives you an almost identical experience to the PC game and has reached the top spot on the Chinese App Store. We are more excited about UltraHunt which seems much more polished but, nevertheless, we thought this game deserved to be discussed. Before you download the game, just keep in mind that it is in Chinese but you will figure things out fast if you do choose to give it a try. You can check the video below to get an idea of how the game looks like. Bullet Strike: Battlegrounds – Is This The Mobile PUBG?